Honey Lee at Paris Fashion Week '07 · K-POPPED! Ack! André Kim‘s hairstyle is catching on! Lie Sang-bong, the fashion guru who designed a shower curtain for Chae Yeon, revealed his new Spring/Summer 2008 Collection during the Paris Fashion Week in September. 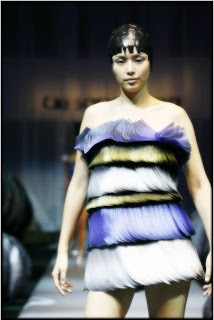 Amongst the plastered haired models was Honey Lee modeling Lie’s futuristic creations. i can barely recognize Miss Korea / Universe Honey Lee in those pics.